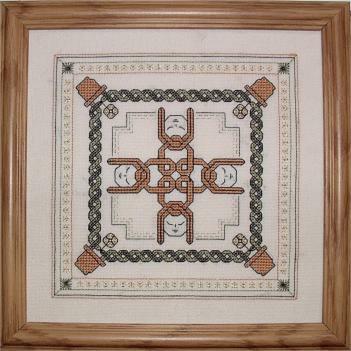 Celtic cross stitch designs are always in demand, and this popular set of four illustrates the elements - earth, air, water and fire - which all hold significance to the Celtic people. 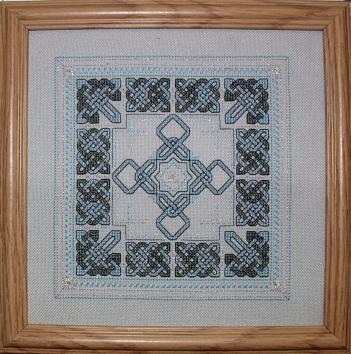 Each design is a fraction over 6 inches square when worked over 2 threads on 28 count evenweave fabric. They can be worked on Aida 14 count, and will end up the same size, but please be aware that they do contain fractional stitches which tend to be easier to work on evenweave fabrics. As such, I recommend that these designs are best for stitchers with some experience of working fractional stitches and of using metallic threads. 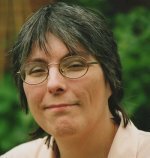 As the patterns are supplied as downloads, you can make your own choice as to which fabric to use. 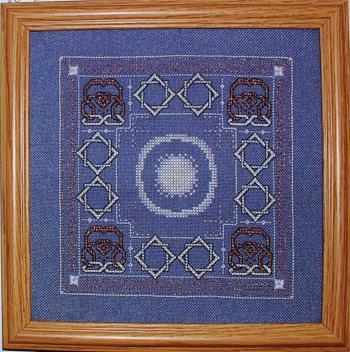 All four designs could be stitched together when finished to create a 12 inch square pillow. 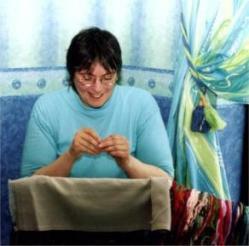 You may prefer to choose a fabric colour sympathetic to all four designs if you wish to do this, however. This design features Mother Earth and the plants she nurtures. It is worked in earth tones and shades of green with a bit of golden sparkle in the border to represent the sunshine that plants need to grow. 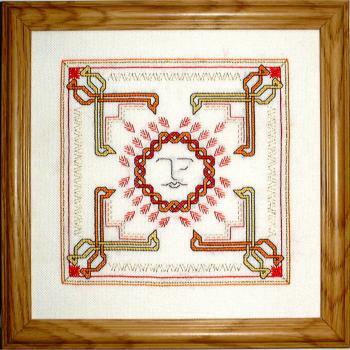 The plants are interwoven in a simple celtic design, as is Mother Nature's hair in the center. This has to be my favourite design of the set, as it features owls (for which I have a passion) in each corner. They are stitched in metallic bronze, with white feet. The center represents the moon, while the stars are featured between the owls. The model was stitched on denim blue Jobelan, but would also work beautifully on black fabric. The myths surrounding the Celtic sun god merged with those of the Roman god Jupiter, who was represented by an eagle, and the eagle came to be a sacred Celtic symbol. In this design we have both the sun and eagles (ok so they have long necks) along with flame symbols. It is worked in hot shades of red, orange and yellow with gold metallic accents. I always have fun with this one at shows. I ask people if they can see the fishes. Most do not spot them at first, and I have to point out that there are four around the star in the center, looking out to the border. I then really baffle them when I ask where the other 16 fishes are hiding! See if you can spot them. This design is worked in blue, jade and silver.